Promotional postcards get noticed and are retained by customers more than flyers, because of their heavy stock and high-gloss celloglaze coating. Postcards are traditionally sent by mail with a personalised message, without an envelope for instant attention with their full colour front. If you want maximum impact with a small space, then print a postcard to promote your business. The two standard postcard sizes are A6 and DL. The A6 Postcard (148 x 105mm) is close to the traditional size of a handwritten postcard. 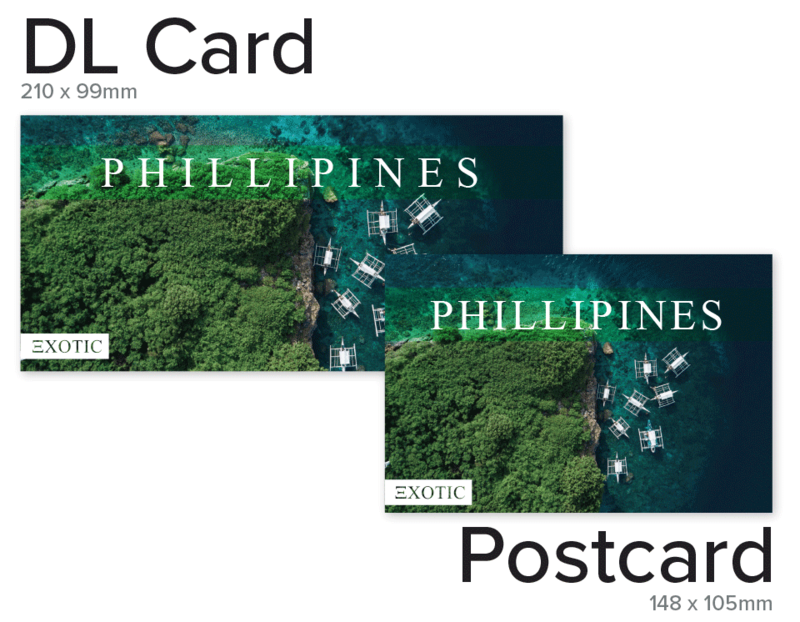 The DL Postcard (210 x 99mm) is the maximum size that you can post in Australia for the price of a standard letter. Print your postcards in single or double-sided full colour. Black and white or greyscale on the back side is the same price as full colour. Double your printable space with a Tent Fold Greeting Card! Tent Folds are available in portrait or landscape orientation, and can be printed on one side or two sides. These promotional cards are supplied flat, with a score in the middle ready for folding. From only $-- each with FREE delivery, checkout our pricelist.